In Save the Homeland, there is a little bit of a difference when it comes to animals then in the other games. In this game you do not start out with a dog. You have to find a dog, get it to like you and then train it and let it love you. To get a horse you also have to get it to love you, then train it to make it love you more and run faster. With the other animals, you may have Cows and Chickens. 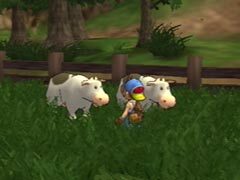 There aren't any Sheep in this game, but the way Cows and Chickens are held up is like most of the other games. Below is a detailed list of the few animals in this game. The Chicken is usually the first animal you add to your farm family. It is an easy way to make a profit, and it is the easiest animal group to expand. You will also need some chickens to complete some endings. Most people think that you just have to go up to the Farmer's Shop and buy one for 500 Gold, no that is a waste of your gold. On the very first day, go to the Supermarket and buy an Egg for 50 Gold. Then go back to your farm and put it in the incubator. It will take a few days but soon you will have a baby chick, then a full grown hen and you will start to pump in the gold! 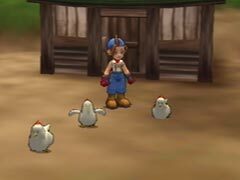 Every day you must feed your chicken using Chicken Feed (10 Gold per Bag at the Farmer's Shop). Every morning your chickens will lay Eggs for you. Collect the Eggs and then you can sell them for 50 Gold per Egg. On Sunny and Clear days, leave your Chickens outside. They will be able to feed on the grass instead of you having to buy Chicken Feed for them. The more you keep them outside, the more they will feel loved and the quicker they will lay Golden Eggs. Make sure that when they are in the Chicken Coop, that you feed them daily. If you do not have 6 chickens, then make sure to only fill int he number of bins that you have chickens, and also to put the feed in the bins with chicken names. The Cow is one of the biggest profit makers in this game. It is also a key role in completing a couple of endings. To buy a cow, head on over to the Farmer's Shop. The cow does cost 2500 Gold, but it is definately worth it. You will also need to buy the Brush for 300 Gold at Louis' Tool Shop and the Milker for 1800 Gold also at Louis' Tool Shop. Talk to, Brush, Feed, and Milk your cow every day to show it that you care. The more you love and care for your cow, the better quality milk it will give you. Level One: Grow up nice and strong. Level Two: Produces Small Milk. Level Three: Produces Medium Milk. Level Four: Produces Large Milk. Level Five: Might produce Golden Milk. On Sunny and Clear days, leave your Cows outside. They will be able to feed on the grass instead of the fodder in which you must cut. The longer they spend their time outside, the higher the chance of them producing Golden Milk. Golden Milk is worth a lot more and can be used in a couple of Endings. Make sure to Brush and Milk your cow every day. If your Cow gets sick, give it some Animal Medicine. If you do not give it Animal Medicine, then it will continue to be sick and eventually die. While your Cow is sick it will produce the milk size one down from what it usually produces. If you would like to impregnate an adult cow, give it the Miracle Potion and it will impregnate the cow for 20 days before the Baby Calf is born. 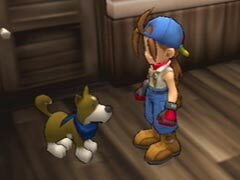 The Dog in most Harvest Moon games is usually given to you right off the bat, but not in this game. In Save the Homeland you must win your dog's affection. To do this start out by putting some food in the Dog Food Dish outside of your house. Each morning you will notice that the food is gone. You will also notice that there are many dogs running around (there are two types; Traditional Dog with Red Collar, Wolf-Like Dog with Blue Collar). They can be found on your farm, Walnut Forest, and the Harvest Goddess Lake areas. If you walk up to them, they will quickly run away and you won't be able to catch them. The only way to get a dog is to get one of the dogs to like you enough so that you can catch him. To catch the dog chase after it, if it likes you enough, you will be able to catch up to it and pick it up using the X button. To get the dogs to like you, just make sure to have food in the dog food dish every day. Once you have your own dog, you can train him in using the Flute (given to you by Louis one day down at Maple Lake). You can train your dog to do many different things (see Dog Tricks). Level One: He is starting to like me. Level Two: He comes to me when I whistle. Level Three: I think he's starting to run faster now. Level Four: He is getting smarter and he listens to what I say. Level Five: A man's best friend, he is my buddy. You can buy your dog a Dog House for 5000 Gold. When you buy this you won't have to bring your Dog in and out of your house at night when it rains. Your dog will be able to sleep inside its dog house. Be sure to feed your dog every day and to train it every day with your flute. This will help your dog to love you more and make it a much smarter dog. Your dog is key to completing one of the endings. The Horse plays a key role in one of the endings. 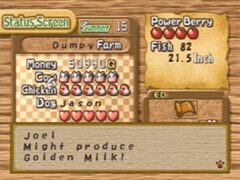 It also can be used much differently in this game then in any other Harvest Moon game. In Save the Homeland, you have the ability to ride your horse all around the Homeland, where you please. You also get to choose the color and type of your horse. To do this go to Brownie Farm and enter the Farmer's Shop. On the list select Part-Time Work and you will start working for Bob. When down at the track, go ahead talk to, brush, and milk the cow. Once that is out of your way, pick the horse in which you like the most. Then talk to and brush that horse and that horse only for that first day. Bob won't agree with how well you did the job, but who cares. From then on go ahead and finish your job right with all the Horses, the first Horse you chose will like you just a little bit more meaning this will be the horse given to you. One day Bob will stop by your farm and give you a horse, it should be the horse in which you liked the most. Once it is at home you can train it by calling it, brushing it, and talking to it. Once it reaches Heart Level 2, you will be able to ride it wherever you want around the homeland. Level One: We are getting along better. Level Two: He can run now. Level Three: He is running faster now. Level Four: Top Speed. He runs like the wind. Level Five: He is confident that he will not lose to anyone. 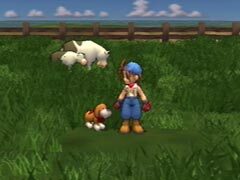 Unlike other Harvest Moon games, your Horse stays in the stable. You must feed it everyday and be sure to bring it inside on rainy days. Make sure to Brush and Talk to your Horse everday and it will begin to like you more and more. 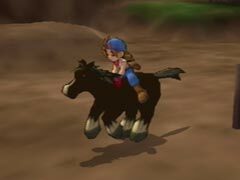 Your Horse will be used to complete one of the endings and it helps you get around the Homeland a lot quicker. The more you Love your Horse, the more it will Love you, and the more respect you will get from Bob and Gwen.